Where the bleep has News and Stuff thread gone? We were at 12000 and counting! I'm hoping Andrew has a good explanation. WTH happened with this mythical thread?? Clearly some things have changed like there's no 20posts limit for one page of a thread! Come on Andrew, bring it back...it was there since 09! Maybe it crashed the server . . .
Adios 2018 season. You won't be missed. Edited 2 time(s). Last edit at 26/11/2018 12:26 by Albi-Quin. To be expected. I do wonder if Paddy is the right guy from an inspirational point of view. True. Unfortunately, however, he hasn't functioned effectively in a small, incorrectly managed team. And obviously, he hasn't proved anything or convinced SMP or Lawrence Stroll to invest . . . the latter buying another team and paying out a contract break rather than stay another day at Williams. It's true, lead from within rather than lead from the front. Williams culture is fixed mindset, historically led by genius. That's admirable but as we know, unsustainable. Besides, if you go through the tough why not stick around for the glory*. True. Unfortunately, however, he hasn't functioned effectively in a small, incorrectly managed team. This...you see, Paddy is a Williams executive. As such, he can be either a part of the problem, or a part of the solution. What he cannot be, is an entity independent of the problem - for the team are not managed correctly/incorrectly for him, it is him, who manage teams correctly or incorrectly. Of course it can happen that you are a hell of a leader, and join a company where you get accountability, but no freedom necessary to make an impact. Then, however, you simply choose to leave because as a seasoned leader you know you'll fail. If this is the case, Paddy should have left a while ago. Is Paddy a part of the problem or a part of the solution? Well, he has not left, so he feels that he was given what it takes to perform. Unfortunately, he failed - that can happen to the best, maybe he needed more time to fix the issues...but he has his last chance to prove he is a part of the solution. 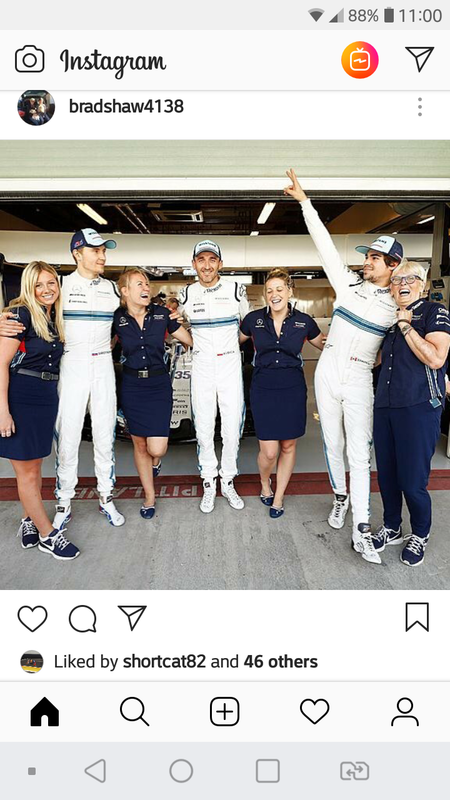 He may be also a part of the problem, in the sense that his impact is irrelevant - Mercedes or McLaren teams would make a good car with or without Paddy, Williams would fail regardless. Then he should be given a boot. Interesting thought. Sadly, we can only speculate from the outside. It certainly appears as if Paddy was in political sandwich between Claire - who reportedly calls the shots - and Lawrence who acted as if he did. This dynamic may change with the departure of Lawrence, though maybe too late. Paddy's silence on the hiring of Kubica was deafening . . . redolent of 'nothing to do with me, mate.' Yet it was reported that Lawrence intervened on Kubica's behalf. There are things that make his position look untenable, no reflection on his ability. What you guys 2 write, is acceptable when written and read but the facts show other things...To me that's the meaning of fallacy, something you can not argue with it but leads you to something opposite to the truth. The fact is we have had DeBeer, Paddy Lowe, Pat and Mike coughlan.All of these guys have performed in other teams so they know how to do their job but when it comes to Williams, they fail.Even Sam Michael was not as bad as it looked in Williams days when he joined Mclaren. That's the fact you can't ignore, these guys don't forget how to do their job suddenly. So to me, it is whether about decision makers, internal processes or maybe they are used in places they were not good enough for or maybe simply they are not listened to in a way they should. Another fact is the team never managed to replace Patrick Head and I can remember very well when he left, Sam was saying what Patrick head was doing in the team was actually the job of 3 or 4 guys.He was doing it alone, the team is left behind from that perspective & I think that's why Pat performed alittle bit better as he was another old school boss. But you can't run the team like that forever and hope to find such a guy every 20yrs...one day it should be corrected and for that, there must be alot of failures to happen before they get it right. Put yourself in Williams management clothes and forget about 2018...It's the early 2017 and you can get a technical director...Who do you select? Was it anyone else who could rival Lowe's achievements? Were you able to ignore the title winning team TD? I'd take Newey . On a more serious note - I tend to recruit on skill, personality and attitude, relying mostly on achievements means you are either not able to judge by yourself here and now, or have a personal preference to rely on external assurance (which is fine as it is the preference of half of the population - that's why you have auditors, awards, certs etc.). As a result, I might ignore the title winning team TD, if I thought he's not a good fit for the task - ie. has got good technical skills but is not a leader, or the other way round. Maybe a person able to make greatest progress with limited resources would be better than a person successfully using the lever of (comparatively) unlimited resources. Certainly it would be naive to think that I can just copy paste leadership between Mercedes and Williams, and expect the same results. Your views in fact are not contradictory to ours. It may be that all those otherwise successful people failed at Williams, because they were not good enough for the task. Or Williams is a toxic and fundamentally flawed organisation, which cannot be fixed even by a genius, because the people staying in power makes sure that nothing changes. Or actually both. I am leaning towards the question mark around Paddy, as I have the feeling he's been given (or has taken) responsibility for a complete vision, from the car, to the driver choice - and didn't do particularly well on either front. The result is that 2019 will be someone else's vision (Claire's? Frank's? ), Paddy is likely to be put deeper into the garage to have the car - and the car only - delivered, with Robert having Claire's trust, possibly because his assertions during the season were right. That's what I sense and read from the information available - and I am certainly sure that Paddy was silent not because he was busy in the garage. Well I'd take Patrick Head over him but let's get real. 1.Newey with Williams, it's done...20yrs ago. 2.Newey is not actually their TD anymore since 2016. 3.As much as he's a design genius, his other aspects in management skills have been awful.Looking at drivers choices, managing their drivers, decisions on power units the team should use and all of the things you question about Paddy, have been the weakness side of Newey. 4.He's always performed in rich, high budget teams.Once he was left with limited budget, the results were mid 2000s RBR cars...His projects & ideas are super expensive atleast by what Mclaren bosses claimed in the time of his departure. So overally, yes, he's probably the best designer out there.But if you are questioning Paddy for his drivers choices, management skills, running a team and working with limited budget, Newey is not the answer. Btw, one thing I want to be informed about your claim on Kubica having Claire's trust while Paddy is pushed into the garage.Would you please clarify what do you mean of that? I mean, Claire has more trust on Kubica for running "anything" within the team except his responsibility (driving the car) than Paddy? I hope not.If the team boss has more trust on a driver than its TD and still keeps that TD in his position, this team is done & I'm sure it's not the case.Just a pure imagination on making this super hero of "Best if his generation", "most fit guy on the grid", "the fastest guy out there" , "the most technically advanced guy" and now "the guy who is there to run something within the team".what's next in his unlimited power? Stan Lee is not dead. Jeewiz Robert sounds unhappy already! I'd however pick him as the TD. My personal bias towards the crazy ones. I would then give him the role most fit to his strenghts - and keep him away from things that would expose his weaknesses. Same could work for Paddy. Btw, one thing I want to be informed about your claim on Kubica having Claire's trust while Paddy is pushed into the garage.Would you please clarify what do you mean of that? Certainly not what you try to be excited about. Exactly what I wrote - Paddy may be asked to focus on things he can do best, no longer being the one and only oracle on anything car and driving related, with Robert's opinions being a counterweight and Claire/Frank standing behind the push for change. Speculation as good as any, but if you think Robert's understanding of his role is "just driving", you will be suprised. What are you on about? Sauber, FI, TR and Haas are on similar budgets and deliver a better product. Patrick Head was not is. Stop being a Williams apologist it makes you look silly. Edited 3 time(s). Last edit at 26/11/2018 22:24 by phatjack.